NEXT HOME GAME: The Go Goodwins Manchester Storm face the Nottingham Panthers at the Storm Shelter in Altrincham, this Sunday 24th January (5pm face-off) in Elite League action. 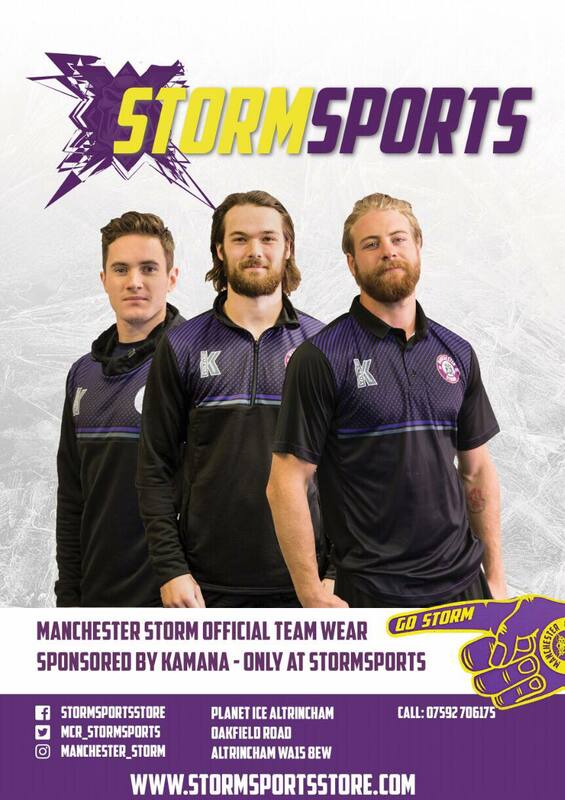 Tickets can be purchased online via the club website, www.manchesterstorm.com, or by calling the Box Office on Tel: 0161-926-8782. The Go Goodwin’s Manchester Storm’s run of scoring in every game this season, came to an end tonight, as they were shut out on the road by the Nottingham Panthers in a 4-0 loss. The first period saw extremely fast paced hockey going from end to end of the rink by both teams. The Storm had a few fantastic chances, while Zane Kalemba in the Storm net pulled off a few miracle saves to keep the score at the end of the 1st 0-0. The second however was a period the Storm and their large travelling support would more than likely like to forget! The Panthers Matthew Myers was able to get the first of the Panthers goals on the scoreboard with just shy of two minutes into the 2nd period. This was followed up less than 3 minutes later when Andy Bohmbach slotted past Kalemba in the Storm’s net. Jury Kolnik was able to net the third goal of the night two minutes later to put the Storm 3-0 down with just over half the game to go. Despite this, the Storm continued to push for their opening goal. The third period once again saw end to end hockey from both teams – but the Panthers were able to intercept every “offensive” pass the Storm made into the Panthers end. Madolora pulled off numerous big saves to keep the Storm at bay, and while on the power play, the Panthers were able to seal the win with less than 2 minutes from the final buzzer, as Robert Farmer grabbed his 5th of the season.